Take me to an ophthalmologist annually to check my peepers. The adorable cocker spaniel is prone to a number of genetic diseases that often affect his sight and hearing. Always purchase a dog from a reputable breeder. Indiscriminately bred cocker spaniels are more likely to suffer from hereditary disorders. Many cocker spaniels live long, healthy lives. The soulful eyes of the cocker spaniel are subject to various hereditary ailments. Among the most serious is progressive retinal atrophy, which eventually robs the dog of his sight. This can occur in affected dogs as early as age 2. Dry eye, formally known as keratoconjunctivitis sicca, affects tear production and leads to other eye conditions if untreated. Older cockers can suffer from cataracts, although surgery successfully treats these in some instances. The condition known as cherry eye -- when part of the third eyelid is visible, giving the eye a red appearance -- is prevalent in the breed. Surgery can correct this. Glaucoma, which causes pressure buildup in the eyeball, also occurs in the breed. 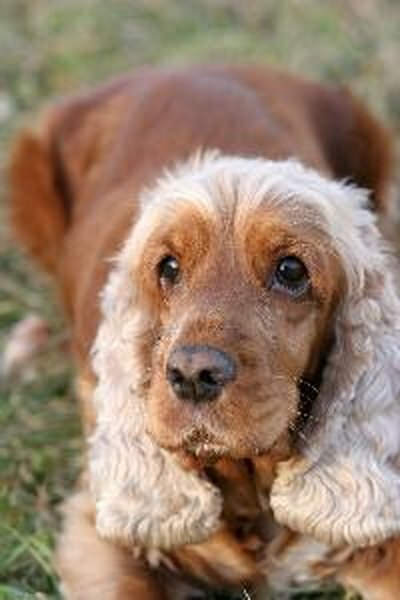 Cocker spaniels, especially young males, can be affected by this chronic liver disease. The effects range from mild to deadly. If your dog appears depressed, doesn't eat well and seems dehydrated, or if you notice any evidence of jaundice (including yellowish gums), take him to the vet for an evaluation. The sooner your dog receives medication, the longer you might have him around. LIke many other purebred dogs, cocker spaniels are subject to hip dysplasia, a malformation of the hip joint. When buying a puppy, ask the breeder to guarantee the hip health of the parents. Hip dysplasia produces lameness, with arthritis at an early age. In some cases, surgery helps. White-haired, blue-eyed cocker spaniels are sometimes congenitally deaf. By the time such a puppy is a month old, there is no longer proper blood supply to the ears. If only one ear is affected, the puppy might have partial hearing. A deaf dog can still make a good pet if you are willing to accommodate his hearing issues. Cocker owners know that those long ears need careful attention, as ear infections are part and parcel of cocker spaniel life. Left untreated, chronic ear infections also cause deafness. If your cocker loses weight, has skin problems, shivers a lot or just doesn't seem quite right, take him to the vet for an evaluation. He might have hypothyroidism, inadequate levels of the thyroid hormone. Thyroid supplements can help with this problem. If your cocker begins having seizures, epilepsy might be the cause. A seizure can affect the entire body or just one part, such as the face or a leg. Certain toxic materials in the environment can trigger seizures, so discuss chemical avoidance with your vet.